Dr.DouglasPuttaert Dr.RachelCherian Dr.TaraKing Dr.RomieDhaliwal OPTOMETRISTS PROFESSIONALEYEEXAMS,OCULARHEALTHCARE,PEDIATRICVISIONCARE,VISIONTHERAPY,CONTACTLENSES,FASHIONEYEWEAR,EYEWEARPACKAGES,ONSITELAB,SUNGLASSES,CERTIFIEDSTAFF. Contact us for your next eye examination and eye care needs VillageFamilyEyecareCentre 4-1870PortageAvenue,Winnipeg,Manitoba (204)943-8252 SteinbachProfessionalEyecareCentre 310FirstStreet,Steinbach,Manitoba (204)326-3265 Twolocations: T he connection is clear to see, since eye health and general health are intrinsically linked. "The things that are healthy for your body are also healthy for your eyes: eating well, exercising, taking care of yourself, in addition to wearing sunglasses with UV protection," explained optometrist Tanya Dillon of Village Optical. "Lots of fruits and vegetables are very protective for the eyes, especially the antioxidants such as dark green vegetables like spinach and kale and darker fruits like blueberries." Another area to set your sights on is preventative care. "A lot of people think they would notice if situations were affecting their eyesight. But even with 20-20 vision, you can still have a serious underlying disorder," Dillon said. "One in seven people will develop a serious eye condition in their lifetime, but a lot of those will go unnoticed. Regular preventative care is your best defence against vision loss." It's ideal to start as young as possible, with the first eye exam scheduled for babies between six months and one year-old, followed by another during the preschool years. Once kids start school, they should go for eye exams annually. "Many parents get the impression that if their child can't read the letters, they can't have their eyes tested, but that's not the case," Dillon said. "We can do it without any input whatsoever from the child. We do a lot of objective tests or use things like pictures or numbers." Depending on eye conditions, adults should visit an eye doctor every one to two years from ages 19 to 65, and then return for annual visits after that. "Your best defence is early detection. Many eye diseases don't have any symptoms at all," Dillon said. "Glaucoma is one of the most common eye diseases. It just slowly, painlessly steals your vision from the outside, so most people don't have any symptoms whatsoever." In addition to glaucoma, common causes of vision loss include cataracts, macular degeneration and diabetic retinopathy. A cataract is a clouding of the lens inside the eye, which causes blurrier vision over time. They can occur at any stage of life but become more common as age increases. Surgery is the correction for cataracts. Similarly, macular degeneration is more common as you age. "It's an eye disease that affects the very central area of vision, so basically the spot you're trying to look right at. It can't be reversed, but treatments are aimed at preventing progression," Dillon explained. "Macular degeneration is widely affected by your lifestyle practices. That's where a lot of those nutritional benefits come in. UV light is another big factor." Diabetic retinopathy occurs in people with diabetes who experience bleeding or swelling inside the eyes, leading to vision change or loss over time. Some other eye conditions tend to sound more ominous than they really are. "Astigmatism always seems to sound like a horrible thing, but it's actually a very natural thing in the eye. It's basically just the shape of the eye. Instead of being perfectly round like a Ping-Pong ball, it's shaped a little more like an egg with a little more curve to the front surface. Most people are born that way, and 99 per cent of us have some degree of astigmatism. It's much more rare to have a perfectly round eyeball," Dillon said. "Presbyopia is another term that might sound intimidating, but that's actually a very natural thing for the eyes as well. Basically when we get into our mid-'40s, reading vision starts to deteriorate when our eye muscles lose the ability to bring things into focus at near (distance). That's a natural aging change of the eyes that everyone will get." While eye exams give you ocular insight, they also provide a glimpse into other possible health concerns in the rest of the body, Dillon adds. "A lot of systemic conditions can show up within the eyes, such as diabetes or high blood pressure or high cholesterol. Even with good vision, we'll still be able to see those signs show up inside the eyes," she said. "The eyes can give a good snapshot of your overall general health." 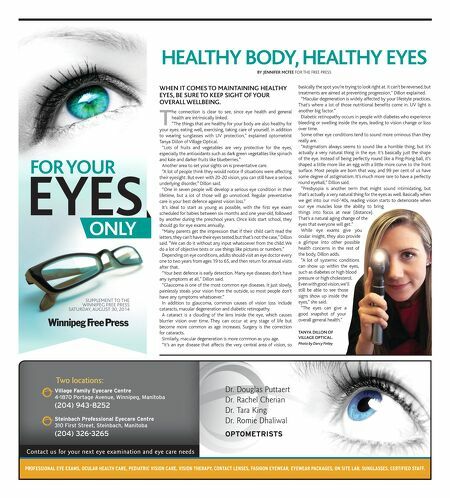 HealTHy body, HealTHy eyes by Jennifer Mcfee FOR ThE FREE PRESS eyes for yoUr only SUPPLEMENT TO THE WINNIPEG FREE PRESS SATURDAY, AUGUST 30, 2014 Tanya dillon of Village opTical. Photo by Darcy Finley WHen iT coMes To MainTaining HealTHy eyes, be sUre To keep sigHT of yoUr oVerall Wellbeing.